At the end of December, right after the above photo was taken, Alex oniugnip and I went out of town to visit family for two weeks. 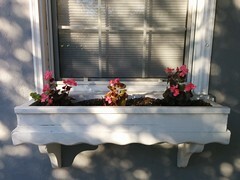 When we got back, the begonias in that pot had met with an awful fate: the blooms were gone, and the plants were limp, brown, and rotting. 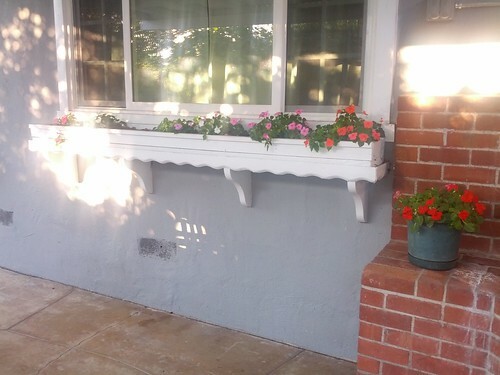 I was mystified, especially since the ones in the window box still seemed to be plugging along just fine. After investigating2, I'm pretty sure that the cause of near-death was overwatering. In early December, California, which has been in a severe drought for over two years, was hit by an "atmospheric river" of rain.3 Here in Sunnyvale, streets were flooded; I think it was the rainiest December on record in San Jose. 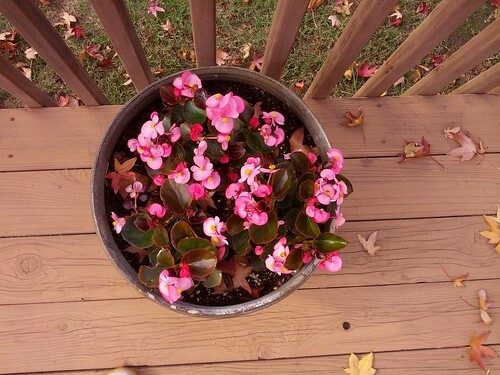 My begonias were exposed to all that rain. Now, all that was in the first half of December, and the photo above was taken on December 22 -- and it didn't really rain any more while we were out of town. 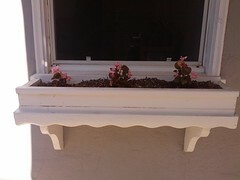 But my suspicion was that the plants were already starting to rot from overwatering by the time I took that picture, and the nastiness just hadn't started to show above ground yet. 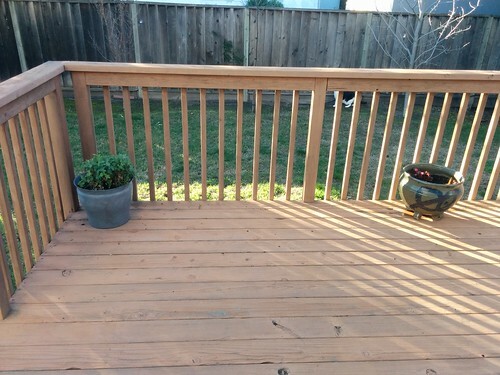 (Or maybe it had; now that I see the photos next to each other, the leaves didn't look as shiny in December as they did in November.) 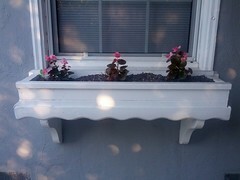 Meanwhile, the begonias that were in the window box weren't exposed to most of the rain, because they're under a huge awning. They probably caught a few drops here and there, but nothing like the deluge that the ones on the back deck got. I'm hopeful that they'll return to their former glory, and I'll keep an eye out for rain -- not like any is predicted. Yesssss. 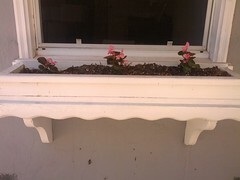 I did end up cutting that part off eventually, though, so it wouldn't destroy the window box. RIP. According to the interwebs, what I'm supposed to do is prune them. I already pinch off wilted blooms and dead leaves pretty often, but actual pruning -- cutting off healthy parts of a plant! -- seems a bit scary. Maybe I'll try it with half a pot and see what happens. I'm excited to see what this lil' dude does. All the plants I bought originally were already blooming, so it would be pretty cool if I can get this one to bloom for the first time ever under my care. Finally, the chrysanthemums! These looked amazing in September, then turned dry and crunchy in October after I failed to water them. 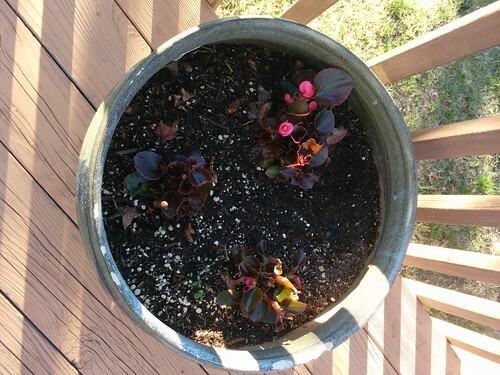 After I started taking better care of them, they had something of a renaissance in November, but eventually those blooms dried up, too. The good news is that Rainpocalypse '14 didn't really seem to hurt them. They're not blooming, but after I brushed away all the old, dead, dried-up bits, they're as vividly green as they've ever been. I wonder if and when the flowers will come back? 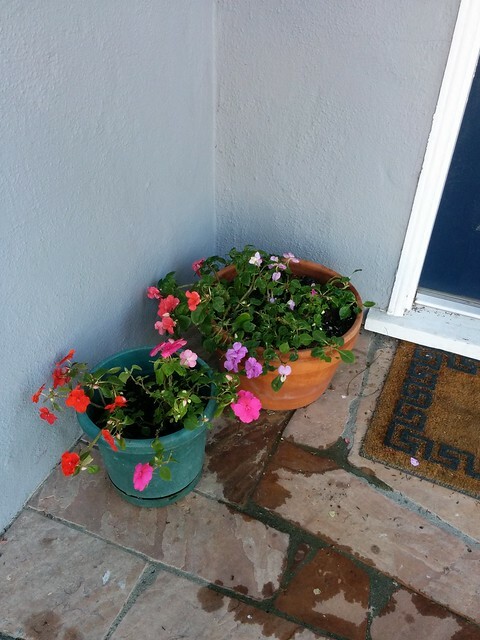 I do wonder if my plants are confused by the weather here. 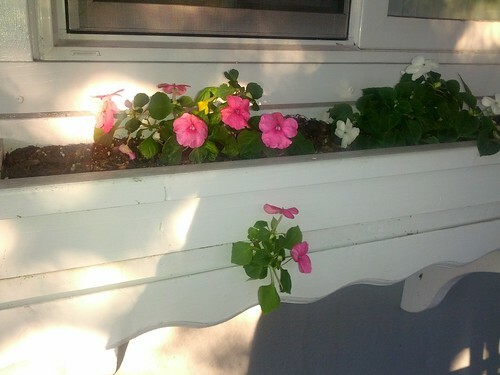 Impatiens, for instance, are annuals; aren't they supposed to die in the winter? But here we are, at the end of winter, and everything is still alive. The coldest it got here was maybe 36° F or so, and that only for a brief moment. Right now it's dipping to around 46° at night, and during the day it can get up to 70°. In other words, it's fantastic. We have a crabapple tree in our side yard, and it's already covered in lovely pink blooms. There's even a frickin' hummingbird flitting around it! 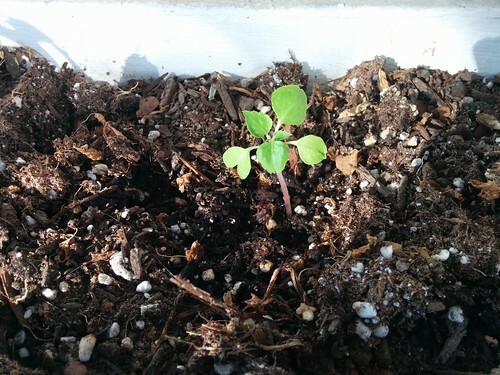 In February! What is this?! Admittedly, most of that improvement was the result of getting a new phone in January. 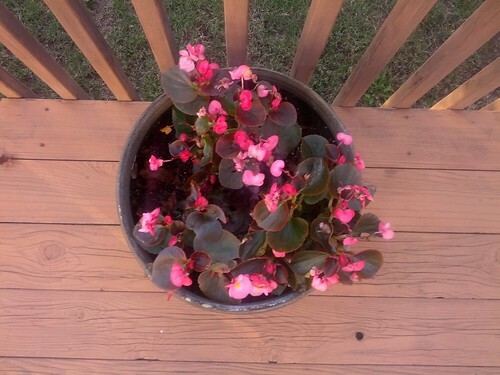 Did you know that there are people on the interwebs who know a lot, and care a lot, about begonias? Of course you did. Although the rain was impressive, it was no match for years of drought. In fact, my vague understanding is that rain on the coast is pretty unhelpful for alleviating drought, because most of it just runs off into the ocean, whereas what we really need is snow in the Sierra Nevada mountains to the east. Most of the Bay Area's water comes from the Hetch Hetchy reservoir, which is in Yosemite, 150 miles east of here, and fed by snowmelt from the mountains. So it was actually kind of bad for the drought that we had a lot of coastal rain, because then people could be all, "Well, I guess we don't have to conserve water anymore! ", while the reservoir that our water actually comes from was as low as ever. Yeah; I feel a little guilty posting this while Boston is getting pummeled by snow.